More racing done since the Horwich crit (I’m claiming 15th in that one, by the way, even though the official results don’t bother going any further down that 10th. I did some Strava based investigations and reckon 15th is about right.) I kicked off with something totally different by racing pedal cars down south. Ace fun. Uses a totally different set of muscles to riding a normal bike so each 30minute sprint-a-thon was really tough, but the racing was wheel to wheel for the whole event, so was so engrossing you forgot all about how much discomfort you were in. Highlights included getting us from about 20th (our grid position at the start) to 1st in my first stint, not rolling the car and eating so much I think I managed to make 9x 30 minute flat out efforts calorie neutral. Back on two wheels and back on the singlespeed mtb for another round of the Midweek Madness evening series. The last round was pretty much pan flat, so didn’t really suit the bike, this time round, at Beacon Park there were some hills and some slower/tighter (and just as fun as anything fast) singletrack. The bike excelled. Where other racers were dropping down gears to climb, I just got on with mashing the bike up the slopes, passing rider after rider. Throwing myself through the mud-lubricated twisty sections with more gusto than semi-slick tyres warranted should have ended in crash after crash, but I managed to stay upright for the most part (if often travelling sideways) and, to my delight, I crossed the finish line in 3rd. A distant 3rd, some way behind Will and Tom, but 3rd nonetheless. Still grinning from Thursday evening’s mtb race, I drove all the way up to the Scottish border to do the Smithfield Road Race. The first lap kicked off in usual style, with me working my way up to the front to look out for any likely looking breaks, but ended all too suddenly when I hit a pothole and pinch-punctured the front tyre. Game over after about 10 minutes. As I rolled backtowards the start/finish line, another lad who’d been dropped from the group passed me and offered a spare tube so I could at least ride back which was extremely nice of him. we cruised back to the line together and, having decided that I wasn’t just packing up and going home after driving hundreds of miles, I headed back out onto the course with a plan to ride at race pace on my own until the Elite group (who’d started 5 minutes before us) caught me. 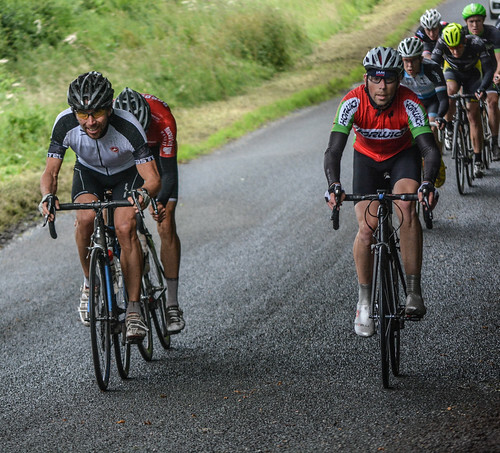 Next up, more road racing, this time over in the Peak District for the Bole Hill race. Last year I got a ride in this one as a reserve and ended up coming 2nd. This time round I got a ride straight after entering, which makes the whole thing less stressful. Oh and it wasn’t pouring down this time either, thankfully! More riding up near the front, looking for breaks to go, generally makng life uncomfortable for those behind ( 😀 ) and occasionally trying to get away myself were the order of the day. One lad got away on the first lap and I assumed he’d be hoovering up the points on offer for the KOM competition the organisers had included (a great idea given how this race actually had a decent climb on it). Staying up at the front as we crossed the line each lap, simply to be ready in case anyone tried to launch themselves up the road, meant I kept picking up the points for 2nd in that competition, so I assumed that’s where I’d end up in the overall. Everyone looks delighted with the pace! Pic by Ellen again! The following weekend (yep, I got in 3 road races in 3 weeks. Unheard of! ), another long drive,, this time to Anglesey. A 2/3/4 cat race this time on a course I had no idea about. Despite the utterly miserable weather (Think: shivering while stood around waiting for the lead out through town, in July!) it was really good fun. 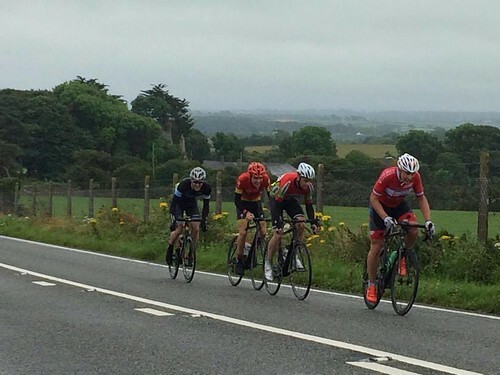 I was to far back, taking it too gingerly down the fastest descent (putting myself at more risk really, surrounded by people locking up wheels/crashing), when a big break of 12 riders got away. They were gone by the time I worked my way up to the front on the following little climb. 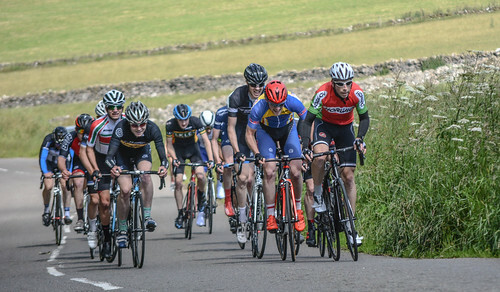 I watched a rider sprint off the front of our group and, when he started to slow, about 10 seconds up the road from us, decided to try and ‘picggyback’ him to get meself further up towards the (now fairly distant) breakaway. Getting over to him was easy enough, but I’d misjudged just how windy it was, so was delighted when a group of four other riders joined us before I tried to launch myself off again.